While there were plenty of teams that got lots of hype for superstar drivers or new cars at the Rolex 24 this year, it was the relatively low-key No. 5 Cadillac DPi-V.R of Mustang Sampling Racing that limped it in for the overall win. They didn’t just beat their own engine overheating issues at the end—they beat an old distance record. Filipe Albuquerque drove the No. 5 home after 808 laps and 2,876.48 miles to set a new record distance of any runnings of the 24 Hours of Daytona and a new record number of laps for this race. But it wasn’t easy—Albuquerque told Fox Sports that his steering wheel was “lit up like a Christmas tree” with various errors as his car was overheating. The No. 5 slowed dramatically at the end of the race as Albuquerque was instructed to kill the engine on straights to cool the car down faster with two minutes left to go. Fortunately, the No. 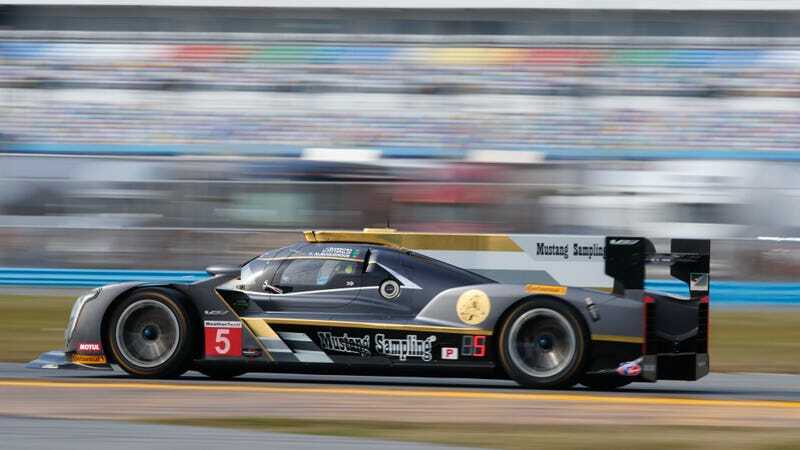 5 had fewer issues than some of its tire-popping competitors in the Prototype class and had built up a decent gap of nearly an entire lap on the next fastest car at the end. The GTLM class had even more of a gap between the leaders and the next fastest cars. The two Ford GTs looked untouchable for much of the end of the race, with the No. 67 Ford GT giving team owner Chip Ganassi his 200th win at the end, right ahead of its sister No. 66 Ford GT. It was driver Richard Westbrook’s first Rolex 24 win out of twelve tries. Yet the GTLM results also speak to what some are claiming is unbalanced performance in the class, with the two Fords finishing two laps ahead of the next car in the class. BMW, for one, never felt as if their new M8 GTE even had a chance today, as the series forced it to run less boost in an attempt to even it out with the other cars in GTLM—but which ultimately didn’t give them enough power to run similar times to the other GTLM cars. The No. 24 and No. 25 BMWs finished seventh and ninth in the class, respectively. GTD also saw another first, as the No. 11 Lamborghini Huracán GT3 of the GRT Grasser Racing Team became the first Lambo to ever win the 24 Hours of Daytona. While everything wasn’t perfect—between the balance of performance and the volatile tire situation that forced last year’s winners to retire—it was definitely cool to see records get reset.